Recently, I was traveling from Atlanta to Chicago. To avoid any nasty surprises from Atlanta's nightmarish traffic, I left for the airport very early. Given my love of commercial aviation and airports, I did not mind an early arrival at all. I also knew that I could pass the time in the The Club at ATL. Though I have had my Priority Pass membership since April, this was my first chance to visit The Club at ATL and I was impressed. While not as posh as the British Airways Galleries lounge I visited at Newark Liberty International Airport in June, the Atlanta facility definitely beats sitting in the terminal or concourse for two hours. The Club at ATL is located on the second level airside overlooking the main atrium of the new international terminal (Concourse F). Unlike many airports, the international terminal is accessible by all travelers that have cleared a TSA checkpoint. Just inside the entrance is a modern reception desk. Entry was simply a matter of presenting my Priority Pass Card and boarding pass and signing an electronic receipt. The lounge is effectively divided into two sections but there appears to be little difference between them, i.e., one side was not designated as a quiet or business area. A staffed bar, buffet and light snacks are located in the area to the right after you pass the reception desk. In the area to the left of reception are light snacks and an espresso machine. Each side has seating facing an exterior window that overlooks the international departures drop-off driveway. If you are a airplane fan you will disappointed with the view since you can only see the two north runways in the distance but no ground operations. Seating is comfortable with a variety of leather and fabric upholstered chairs. There are a variety of tables for those that want a place to eat or a workspace that does not require their lap. There are power outlets attached the sides of the armchairs so powering and recharging your electronic devices is a piece of cake. I was there on a Wednesday evening and there was no crowding and plenty of seating available. I don't drink so I can't on the quality of the bar. (See here for a review of alcohol offerings.) The food on the buffet was very basic, more for snacks than a meal. The buffet spread included hummus and pita bread, small sandwiches, two different soups, veggies, cheese and boiled eggs. I was able to make a small dinner from two trips to the buffet and probably ate healthier than I would have with the fast food available in the international terminal food court. Snack food placed in a couple of spots in the lounge included popcorn, Oreos, and Lorna Dorn cookies. At one point, an employee circulated the lounge offering bite-sized cheesecake. A double espresso made a great complement for the cookies and cheesecake! The club offers showers but I did not check these out. The bathrooms are very clean and contemporary in design, a big improvement to the general restrooms you find on some concourses in the airport! Also, the club has its own WiFi network so you can avoid any overload that might occur on the main airport WiFi. 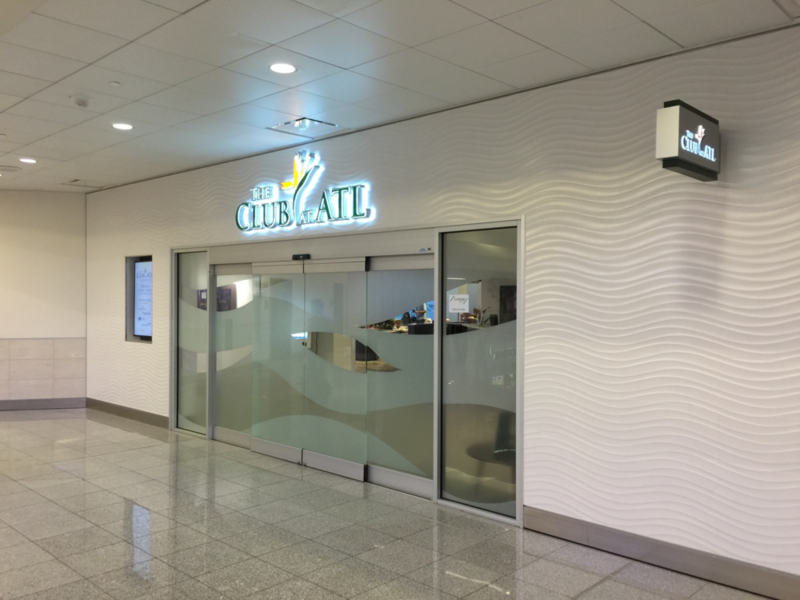 The Club at ATL is a great amenity for travelers passing through one of the world's busiest airports. I really enjoyed my time in the lounge. 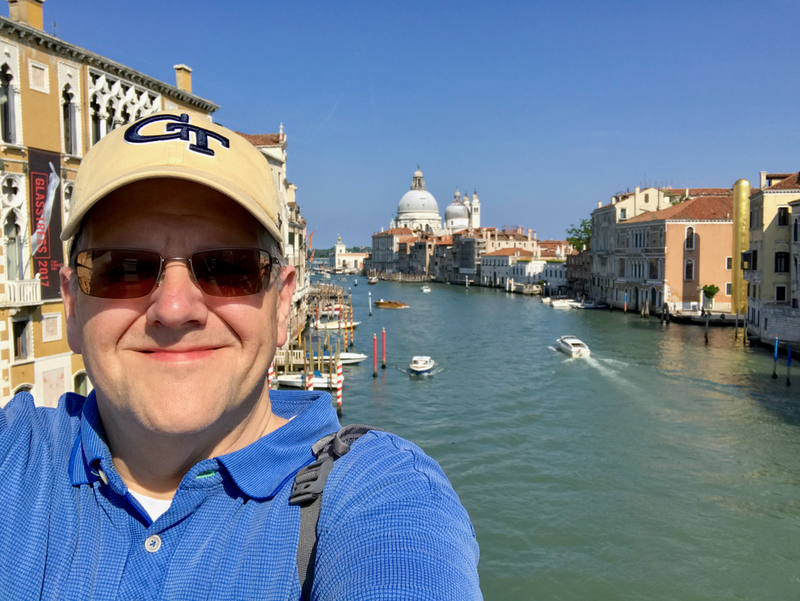 I was able to grab dinner, get online and get some work done and generally relax, having avoided traffic, before my flight. Would I pay $35? Living in Atlanta, I really would have little need to buy a day pass, but if I were connecting through Hartsfield and had a multi-hour layover, the $35 fee could be easily justified, especially if I would have to buy dinner and would like to freshen up with a shower.